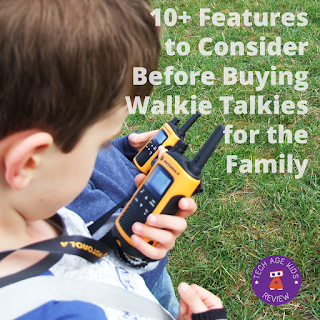 Walkie Talkies, or two-way radios, are a great bit of technology for families to have. They can be used for practical purposes, safety and just having fun. 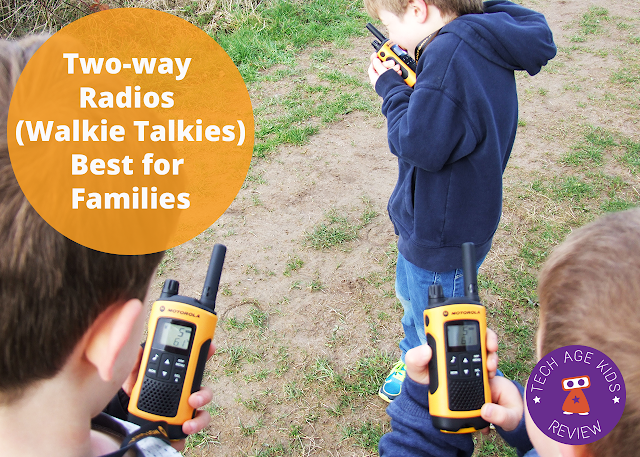 Walkie Talkies are excellent when you are in areas where mobile (cell) phone reception is poor and they are fantastic for use with children who don't yet need a mobile phone.In this article we'll take a look at what you can do with two-way radios and what to look out for when buying them. When we last went camping the family in the tent opposite had a set of walkie talkies with them. The children took one unit while the parents had the other. This meant that the family were able to give the children more freedom since they were in regular communication. They also used their Walkie Talkies for practical purposes like sending one member off to see if the car gate was open yet. When we got back from camping I started to research the features of family-friendly two-way radios to decide what kind it would make sense to get. We wanted kid-friendly but non-toy walkie talkies that could be used over a reasonable distance. What will you Use a Walkie Talkie For? Before buying a set of walkie talkies it's worth thinking about all the situations that you might use them in. This will help you to work out which features are going to make sense for your family. Camping. Giving the kids some freedom around a camp site and allowing communication between different family members. Hikes and other outdoor activities. Sometimes it makes sense for a group to split up. Maybe your younger child can't cope with the full route. Walkie talkies can help everyone to keep in touch and meet up again. Theme parks, festivals and other big events. Just in case a younger child gets separated from a group or to allow different group members to do their own thing for a while. Allowing kids to have some independence. It's nerve-racking to for parents when their children make those first lone trips to the park or to a shop. Being able to keep in touch allows for a more gradual transition. For younger kids it's great to be able to allow them to go on a little way ahead during a walk. Delaying the need for a mobile phone. A walkie talkie can be used during the time when a tween needs to be able to communicate with parents when they go out but doesn't really need a mobile phone with its associated call charges. Coordinating multiple cars on big trips. We often go away with family members and have three or four cars to try and get to the same place. Having a walkie talkie in each car makes communication much easier. Around the house and garden. We've kept the baby monitors that we had when our children were younger and have used them like walkie talkies. A little lazy perhaps! But handy for calling the kids down when their food is ready or reminding them what they went upstairs to get. Walkie talkies can be used in this way too. Kids enjoy using walkie talkies as part of their role play. There's lots of fun to be had when cousins or friends come round to visit. When you're buying a new gadget it can be hard to think of all the important features when you're at the buying stage. In this section we'll take a look at all the features you should consider before buying walkie talkies for your family so that you're well informed and can work out what is important for your family. Some features are trade-offs against each other and others mean paying more money. There's no point paying extra for a feature that your family won't use, but it's a real pain to wish you had gone for a better model later when it's much more expensive to do anything about it. A lot of cheaper walkie talkies use batteries while newer and higher end models tend to have rechargeable batteries either via a proprietary charging station or a USB cable. There's definitely something to be said for being able to take spare batteries and not have to worry about taking a charging cable / station. But, just being able to put the devices on to charge along with our other devices is convenient, especially when you are possibly talking about one device per family member - that's a lot of batteries to keep replacing and recharging if you use rechargeable ones. Having batteries that will last well without changing batteries or recharging is important. Time taken to charge batteries is also important. We decided that we wanted rechargeable walkie talkies. You want to minimize the likelihood of other people being able to communicate with your children by using the same frequency. If you choose walkie talkies with just a few channels then it's very possible that other people will be able to communicate with your children. You might decide that this is okay if you just plan to use the walkie talkies as a toy for younger children who will always be supervised, but when you want to use them to give older children some freedom then you may be concerned. Some walkie talkies offer privacy codes that can be used in addition to having different channels. This is a worthwhile feature when using the devices with children. Note that even with privacy codes you shouldn't consider your communication to be completely secure. There is a risk of eavesdropping and other people being able to communicate with your children. Make sure your kids know what to do if they every find themselves in this situation. The operating ranges for walkie talkies are often very optimistic compared to realistic situations so make sure that your requirements are well inside the quoted distances. A lot of kids are pretty tech savvy, but younger children in particular will need a simple interface. When you think of walkie talkies you probably think of pressing a button to talk. Well you can still do that, but a lot of modern devices support Voice Operated Exchange (VOX.) VOX triggers voice transmission when it detects sounds over a certain level. If you expect to use your walkie talkies after dark then make sure they have a display that lights up. Higher end walkie talkies often have the option for using an audio headset rather than the speaker. This is convenient when you want to wear your walkie talkie on your belt and not have to take it off to speak. Walkie talkies normally allow you to communicate with everyone in the group at the same time. Direct call allows you to talk to just one person. This might be helpful for communication between parents without the kids hearing ("do you think we should go for ice-cream now or do you want to wait until later." If younger children will be carrying or wearing the devices then weight is an important consideration. To some extent this will be a trade-off with battery life as batteries will make up a large proportion of the weight of your device. Many walkie-talkies take 3-4 AAA batteries which are fairly heavy so do take this into account when thinking about children carrying them for long periods of time. Robustness and weatherproofing are features that tend to cost extra. But we want the kids to use these devices. Of course we'll tell them that they need to be careful but we don't want to be nervous about handing over delicate tech. We also want to be able to use the devices in all weathers. We can't control the weather when we're camping and sometimes it's going to rain heavily! The family we saw using walkie talkies on our camping trip just had a pair of units. Generally the children took one and the adults kept one at the tent. But there was a time when one of the children came back without the other and another time when the parents wanted to be in different places. We decided that we'd get the most value from walkie talkies if we each have a device. We might just use two units some of the time, but it seems like there will be plenty of situations where we'll want one each. Most walkie talkies will allow additional units to be set up to allow larger groups to communicate. If you have a very large family or plan to use the devices with groups such as scouts then do check the maximum number of devices that can be used together. Some models have a vibration alert. This could be useful when used with a headset if you want your kids to be able to contact you discretely. For some tech purchases we're happy to get something really cheap and not worry too much if it breaks. In this case we're looking at getting a set of four devices, one for each family member, and we want to be using them for years to come. We really don't want to have to write off the whole purchase if one unit gets lost or damaged, or a rechargeable battery stops holding its charge well. This means that it's important to choose a well-known brand so that it should be possible to obtain replacements if we need them. We want to be able to easily spot our walkie talkies if the kids put them down outside. We didn't want to choose a dark colour, or a camouflage design. There's a good reason that lots of walkie talkies come in bright colours like yellow! Having a torch built in to a Walkie Talkie might seem like a gimmick, but we like to go camping and having one device that the kids can use for communication and illumination rather than having to use two makes a lot of sense. They are much more likely to be able to easily find one device and less likely to drop one of them or leave one behind. Actually that goes for me as well! The laws regulating two-way radio use vary from country to country. Be very careful if you are planning to buy walkie talkies to use on a trip to another country. You will need to make sure they can be used there. For example, in the UK you will need a license to use two-way radios that operate on some frequencies. We decided that the performance we can get from Walkie Talkies that do not require a license would be sufficient for our needs. If you're in the UK, don't be tempted to import cheaper models from the US, you need devices that are legal to use in the UK. Prices for walkie talkies range from under £10 / $15 per pair for toy versions through to £20 / $30 basic models up to over £100 or $100 (typically cheaper in the US) for a set of four high end walkie talkies for active families. 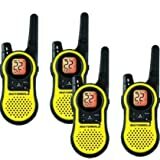 Toy walkie talkies are fun for little kids but we decided it was worth investing in a decent set that we would be able to use for years. Which Walkie Talkies Did We Choose? We're in the UK and we chose a Quad set of Motorola TLKR T80 Extreme two-way radios. A similar model in the US is the Motorola MH230R. We chose the fairly high-end Motorola model because we felt that we would make good use of the higher end features and that if we bought a cheaper, more basic model then we would regret it later. My children were 7 and 8 when we bought them so we expect to be using these walkie talkies for several years. We chose to get a quad set rather than just a pair because we want our kids to be able to keep in touch with each other as well as us. And we want to make sure that as parents we can both keep in touch with the kids even when we're not together. It also gives us the option of two pairs at times when we each have a child with us. The Motorola T80 Extreme two-way radios have lots of features including support for VOX (though this requires a headset), torches, privacy codes, calling individuals and they are robust, brightly coloured and weatherproof. They come with plenty of accessories including belt clips, lanyards and headsets. And they have the best of both worlds with rechargeable battery packs that can be charged inside or outside the devices so you can buy and charge spares for longer trips. They use a cradle rather than being USB rechargeable, but we can live with that. A year on we've been really pleased with the purchase, I'll write up a full review in a future post. As well as using the walkie talkies for camping and days out they also get taken to the park, especially when the kids have friends visiting. Kids love walkie talkies! While these devices have plenty of fancy features their basic usage is very simple. They are easy to turn on and kids just need to press the button to talk which they soon get the hang of. There have been lots of occasions when we have wished we had taken them with us but didn't think about it in advance. We need to get much better at remembering to take them with us when we go out. We do wish they weren't quite so heavy, but this is likely to be a trade-off with battery life so we can live with it. The included lanyards have turned out to be a really important feature for us so kids can't just put the walkie talkies down and forget where they put them but they're still on hand. The built in torch is also really convenient. I have had a lot of fun playing hide and seek in the park with my son using walkie talkies - this allows you to cover much wider areas and you can give clues over the walkie talkies if this aren't going well.